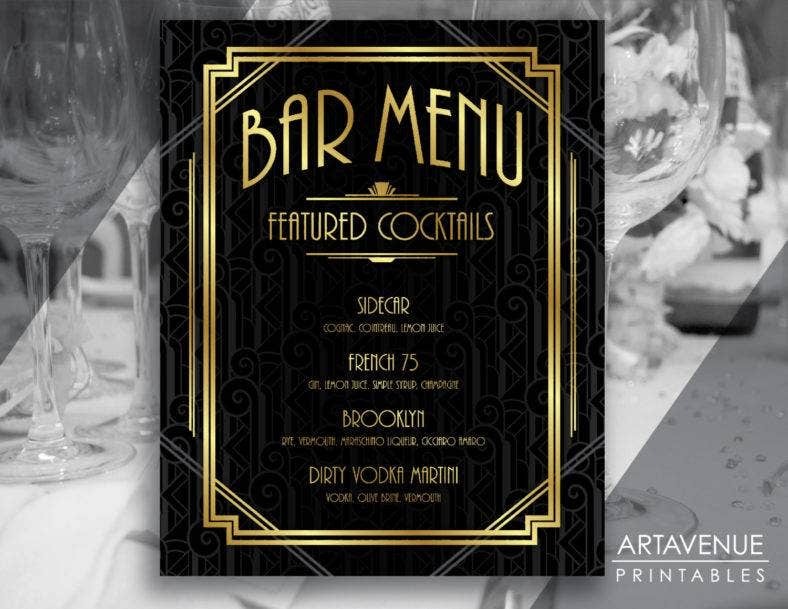 Have you watched the movie “The Great Gatsby?” If you have, then you would be familiar with the design of the menu templates we are going to show you. With all its glitz, glamor, and class, that movie was the perfect medium to showcase the magnificence of Art Deco. From the poster to the actual film, the production epitomized the sumptuous luxury of the Art Deco style. But, before we delve into the menus’ designs, let us first talk about the revolutionary movement in decorative arts that shook the 1920s. You may also see event menu in PSD. The term Art Deco was derived from the Exposition Internationale des Arts Décoratifs et Industriels Modernes, which was held in Paris in 1925. Art Deco symbolizes wealth and sophistication, and it is usually found in jewelry, buildings, and other designs from that era. The simple, clean shapes with a “streamlined” look are what makes Art Deco distinguishable from other design movements. It embraces the admiration for the modernity of machines and the design qualities of man-made objects. You may also see vintage menu designs. 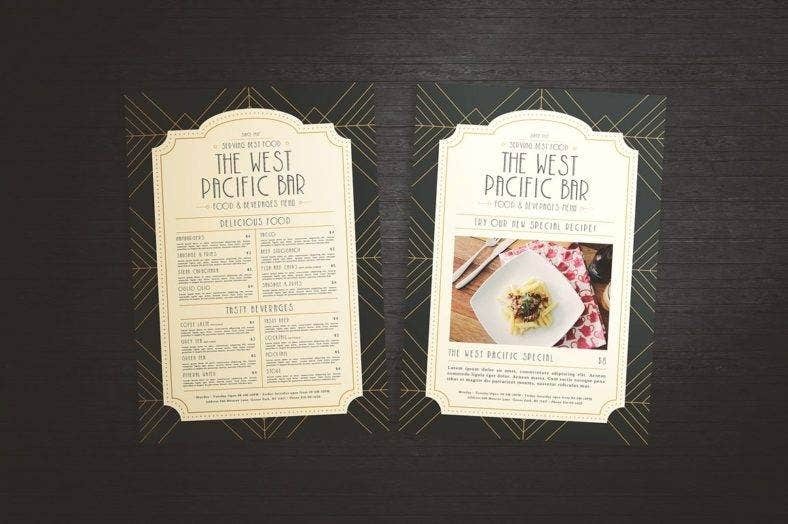 So, if you wish to add a touch of vintage elegance to your restaurant, choose any of these gorgeous menu templates we have collected for you. You may also see food and drink menu designs. The shapes and lines used in the layout are as classic as you can get when it comes to Art Deco. The font style used in the texts complement the design very well. What truly makes this menu eye-catching are the inverse colors on both sides. The shapes, lines, and colors are pretty much the standard in Art Deco. A classic design such as this would surely help establish the Art Deco theme for your restaurant. It has a standard size of 8.5 inches by 11 inches and is oriented in portrait style. The files include formats compatible with Adobe Illustrator, Adobe InDesign, Microsoft Word, Adobe Photoshop, and Microsoft Publisher. You may also see dessert menu template. The combination of the dark blue-green background and the gold color used in the borders and texts match up perfectly. It is an Art Deco design, but it is also reminiscent of Aztec designs. Aside from the colors and borders, the information for each dish is placed well so that the details do not crowd the menu. So, if you want a simple approach on Art Deco, this design will definitely fit you well. All files are sized at 8.27 inches by 11.69 inches and the layout is oriented in portrait style. The texts and images are fully editable. It includes PSD files so you can edit it using Adobe Photoshop or any software program compatible with it. You may also see pizza menu designs. The designers for this template really know how to use colors well. The dark background emphasizes the curved borders used for the layout of the actual menu, and the symmetrical design shapes are a great addition to the design. The front of the blank menu offers enough space to highlight the featured dish and, at the back, lies the menu list of your food and beverages. The pure elegance of this template exemplifies the true Art Deco design. Give it a try! The template’s dimensions are measured at 8.27 inches by 11.69 inches and oriented in portrait style. Everything is customizable from the texts to the pictures and the colors. So, edit it as much as you want! You may also see BBQ menu templates. What is a traditional wedding without a white motif? 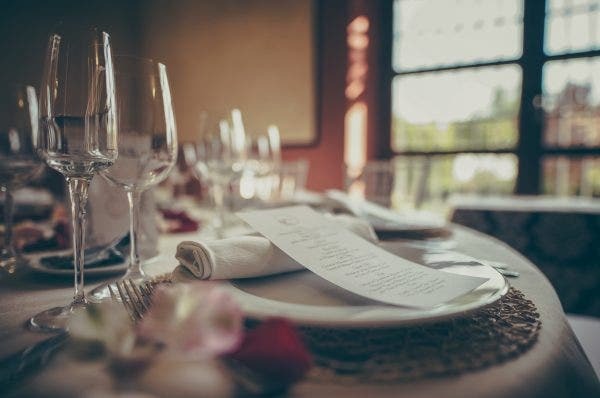 Some couples plan their reception to go with buffets, and there are others who limit their wedding menu and handpick the best dishes to serve to their guests. This menu design fits best with the latter. The design for this template is as simple as the menu list. The dotted figures look like chandeliers that add vibrancy and class to the layout. It is a clean design perfect for your wedding reception! It is a fully personalized handmade item sized at 4 inches by 8 inches and is oriented in portrait style. It is fully editable so you can change the texts and colors as you prefer. 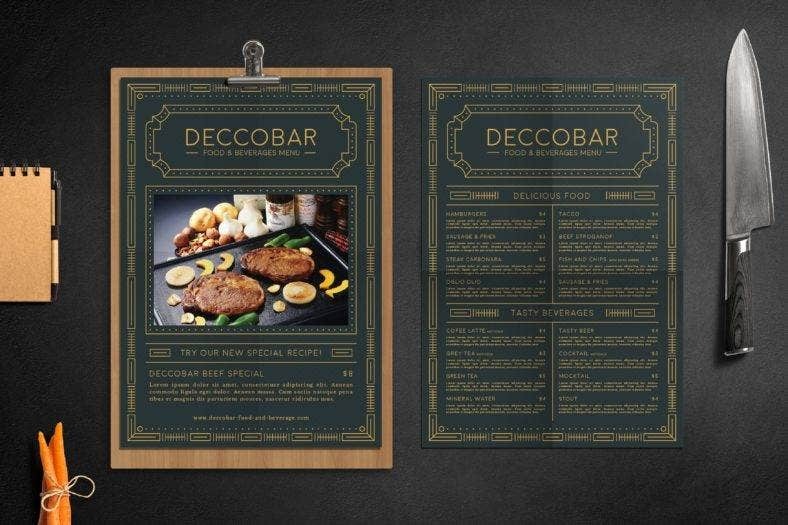 This sample menu template is only sold in sets and it starts at 50 pieces per set. 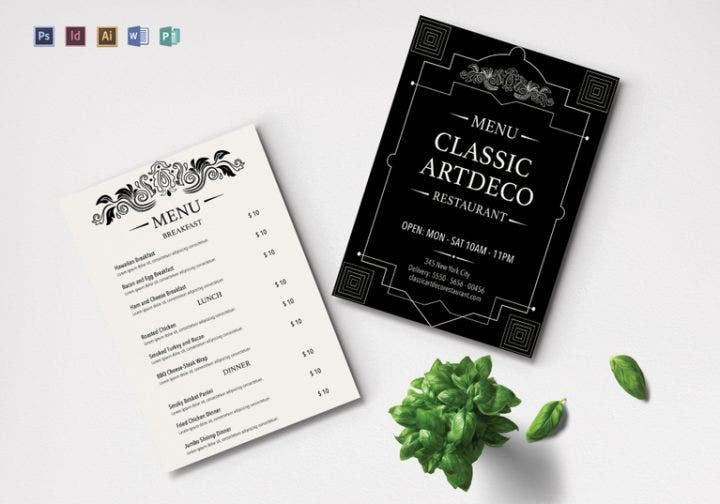 You may also see beautiful restaurant menu designs. People will be able to immediately tell that your bar is extraordinary once they see you using this layout for your menu. The gold colors create an impression that everything in your bar is expensive, and the gradient that comes with the color creates an illusion that the lines are shining. The background patterns are a great addition to the layout, and its gradual fade in the center emphasizes the text even more. People would definitely go to your bar expecting drinks and service of the highest quality when they see this menu. This template comes in various sizes and they are all oriented in portrait style. Only the texts are customizable and you can send your customization request to the designer. The files that will be sent afterward include high-resolution images and PDF files. You may also see free menu templates. Planning a sample thank-you party for your loved ones? Use this template as the design for your menu to impress your guests. Although the layout gives more space to the texts than the design, it does not have any negative effect on its overall appeal. A full-course meal will definitely fit on this food menu as it is sized at 4 inches by 9.25 inches and styled in portrait orientation. In order to customize the word menu, you need to send the details to the designer. You can choose whether to have the digital file and print the menu yourself or have it printed already and then shipped it to you. Should you choose the latter, please be reminded that this template is only sold in sets and it starts at 50 pieces per set. You may also see breakfast menu templates. It is unusual for menus to be rounded, and not all people would go beyond the norm. That is why with this template, you certainly will not go unnoticed. The circular design is meant for special occasions as it is made to stand out and grab the attention of guests. Although it is round, enough space is still provided so you can include information on all the dishes for a full-course meal. This menu fits perfectly on most standard plates as it measures 6.5 inches in diameter. Be reminded that this menu can only be purchased in sets, and each set starts with 25 pieces. Choosing this template might be the best idea for your event. So, choose this one now and immediately send your customization details to the designer. You may also see sample restaurant menu templates. A menu cannot get any more stylish than this one. This template is meant for formal events such as galas, weddings, and award ceremonies. The black and white theme of this menu radiates elegance and class while the glitter adds a glamorous touch. It looks like it comes straight from A-list events that only the chosen few can enter. This menu is quite a show-stealer. Do not wait for stocks to go low and send your customization details to the designer now. This template measures 5.5 inches by 5.375 inches and is oriented in portrait style. Be reminded that the minimum order for this takeout menu is at 25 pieces, and any order below that number would be subject to a design fee. You may also see chalkboard menu designs. 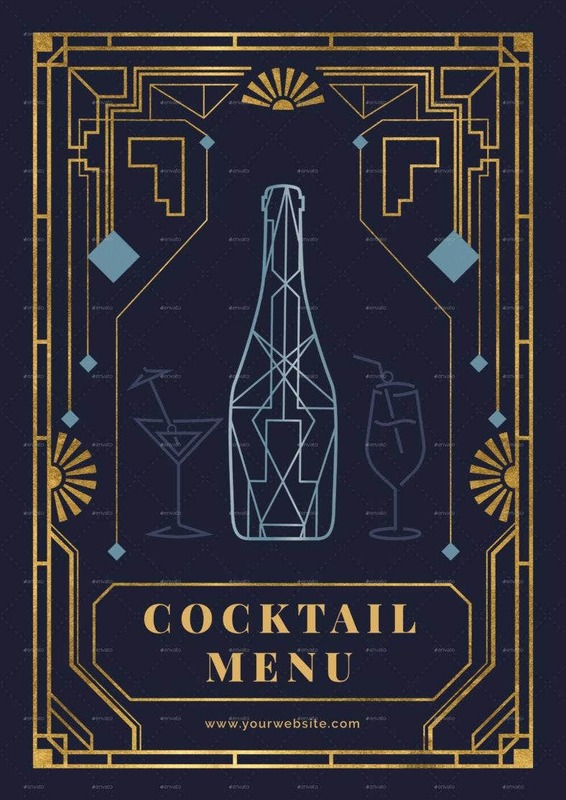 With all the lines and shapes, this looks a lot more like a blueprint than a mere design for a cocktail menu. The stylish design gives an impression that your cocktails are anything but ordinary. It also exudes a certain vibe of being exclusive only to those who can afford it. This template is available in the A4 size and is fully customizable. Send your customization details now and impress your guests! You may also see restaurant menu templates. These designs are curated from the best of the best. Whatever design you ultimately you choose, make sure that it is the right one for the event. Adjust the necessary details and designs to your preference. Good luck and have fun selecting your favorite from our list! You may also see drink menu templates.